I Rise Up From the Water. The wearable artist books of Johanne Renbeck walk the runway at the Book Arts Summer in Salem (NY), the annual festival that opened this year on July 11 and continues through September 3, 2012. If Vogue's Anna Wintour does not attend, it's okay. The devil may wear Prada but it's unlikely she's into reading what she's wearing. And Kate Moss is just as unlikely to model Renbeck's books even though they were purposely designed to hang on a stick. Johanne Renbeck holds a BA in English Literature from the University of Rochester. She studied painting, drawing and sculpture in continuing education programs at Rochester Institute of Technology and Bard College and with Helen Frankenthaler at the Santa Fe Art Institute. Interest in the world of nature and how it nourishes language and myth has prompted extensive independent study as well as courses in Egyptian hieroglyphics. 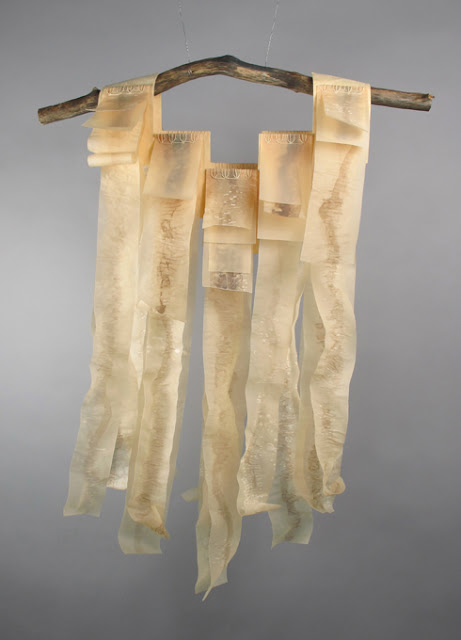 Ongoing studies in the field of book arts have led her to workshops with Susan King, Daniel Kelm, Sarah Langworthy, Carolyn Chadwick, Ed Hutchins, Robert Walp, Pamela Moore, Pamela Spitzmeuller & Mary Hark. Book artist Paula Beardell Krieg's Bookzoompa work is also on display during the Books Arts Summer In Salem, held at the North Main Gallery and Annex, as well as an exhibit of visionary tunnel books created by student artists. Book artist Ed Hutchins curated the exhibition. These may be the only books that, rather than shelved, must be either hung on a wall, or in a closet above the rack of wearable book shoes, an as yet unexplored form of artist book with fertile creative opportunities for literature always at your feet. The chance to say to someone, "Read any good shoes lately?" is, for me at least, an irresistible possibility. There's poetry in hoofwear for the discriminating book lover with sensitive soul and instep. See more of Johanne Renbeck's wearable books here.